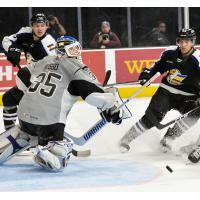 SAN ANTONIO - Stephen Perfetto opened the scoring with his first goal of the season, but the Colorado Eagles (2-1-1) responded with three unanswered goals to earn a 3-1 victory over the San Antonio Rampage (1-3-0) on Saturday night at the AT&T Center. JC Beaudin and Scott Kosmachuk scored in the first 7:31 of the second period to erase a 1-0 Rampage lead. Nicolas Meloche would add an insurance marker early in the third period, and goaltender Pavel Francouz made 30 saves to earn his second win of the season. Perfetto scored his first of the season on his first shift of the season, cutting to the front of the Colorado net to redirect a Sam Lofquist shot under Francouz's arm at 2:24 of the first period. With the assist, Lofquist also earned his first point of the season. The Eagles drew even just 51 seconds into the second period, when AJ Greer fed Logan O'Connor at the bottom of the right circle. Ville Husso made the initial save on O'Connor, but Beaudin finished the rebound for his first of the season. The Rampage were already shorthanded when they were called for too many men on the ice at 7:02 of the second period. During the ensuing 5-on-3 power play, Kosmachuk took a feed from Andrew Agozzino at the bottom of the left circle and lifted a shot over Husso for Colorado's first power play goal of the season, giving the Eagles a 2-1 lead. Meloche extended Colorado's lead to 3-1 at 1:50 of the third period with his second goal of the season, firing a wrist shot past Husso from the high slot. Husso stopped 33 shots in a losing effort, as the Rampage dropped their third straight decision to complete their season-opening homestand. Brian Flynn's points streak was snapped at three games. The Rampage begin their first road trip of the season this week, a four-game trip through Manitoba, Milwaukee, and Rockford. The Rampage meet the Manitoba Moose on Friday night for the first of two contests at Bell MTS Place, with puck-drop scheduled for 7 p.m. The game will be available on The Ticket 760AM and on AHLTV.